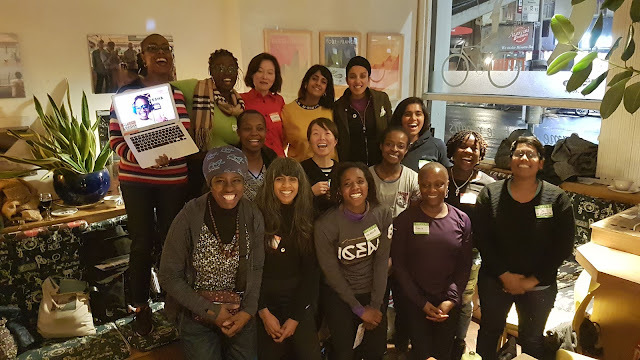 2Wheel Chick: Women of Colour cycling group - is it necessary? Look Mum No Hands! Cafe in London holds various types of events and regular meet-ups. One group they have formed is a Women of Colour meet-up. The first meeting was held in December of last year, and another meeting took place a few days ago. It will now become a monthly event. I went to the first one, as I was a little curious to see how the meet-up went, and as someone who likes to meet different types of people in cycling I was looking forward to meeting new people. Also being experienced in cycling and in the cycling community I was looking forward to sharing lots of information about the cycling scene and giving tips to anyone wanting advice. This group was an initiative borne out of an article written by a woman who bemoaned the fact that she hardly saw any women of colour when she took part in the Ride London 100 last summer. She also claimed to have encountered white MAMILS (middle-aged men in lycra) who gave her "uncomfortable gazes" at the cycle event, or "microagressions" from white males as they overtook her when commuting. This was then picked up on by the likes of Jools Walker (aka Lady Velo), Jenni Gwiadowski and Ayesha McGowan, an Afro-American bidding to become the first black female professional racer, who felt that there was a need to group together black women who don't feel that they could get into cycling because of a feeling of being different from others around them. There were quite a few women, and Ayesha McGowan who linked up to the meeting from her home in the United States via Skype. Although I missed the early part of the meeting it seemed that a lot of the women talked about how they never received encouragement to get into cycle riding, and felt uncomfortable because there was no one else in the group that looked like them. Some felt they were ignored, and didn't feel confident about getting involved, others talked about being passed over to become brand ambassadors for different marketing companies, or that black women cycling are not represented in the media. While I believe every word of what the women say, I still find it hard to say that there is some kind of racial or discrimination problem, or even that there are barriers to entry for black women to get into cycling. That has not been my experience at all, and I have never perceived any barriers to entry or discrimination. No one in my family was particularly into cycling. My dad bought a Peugeot bike in the 80s and I had a go on it a few times, but generally my parents didn't like me cycling. I have two sisters, neither of whom ride a bike and have never shown a particular interest in doing so even though they are aware of all the activity I do on two wheels. I grew up in an area where we were the only black family. There were local people who were happy for me to join their cycling groups, however I didn't have the means to join in. Not having a suitable bicycle, and living in a remote village in Yorkshire where the nearest group was 10 miles away, meant there was no practical means of me joining them. My parents were certainly not going to let me cycle all the way there. And there was no way they would encourage me to ride on public roads. I did bits and pieces of cycling over the years, as described in my 52 Cycling Voices, and eventually got into regular club cycling almost 20 years ago and I have really enjoyed it. Various people have encouraged me over the years - men, women, black, people, white people, including MAMILS! Through cycling I got into journalism and testing out kit for brands. It is true that I have not seen many black people out cycling, and very few black women. However, the numbers are growing. The thing is, I still can't say that the lack of black people cycling would be a barrier to entry. In fact the biggest barriers I have had were from my own folks! My parents did not want me to ride, thinking it was too dangerous. My dad always used to say people who cycle on public roads just want to kill themselves! My mum couldn't understand why anyone would want to ride any distance over a few miles if they could do it by car. Black women that I met when I came to London found it a bit strange that I would like to ride a bike. At dinner parties mentioning cycling was more of a conversation stopper! "Did you find the place okay?" "Yes, I cycled over - it was quite straightforward." "Hmm.... I never understand cyclists - they always get in the way on the road." When I was growing up, getting around by bicycle was seen as something you do because you don't have access to a car. Doing it as a child is fair enough. But cycling around as an adult was just a sign of failure - that you hadn't managed to find a job that paid you enough to buy a car! With these traditionalist views and encounters, which aren't unique to my situation, it's not surprising that black women aren't thinking about cycling as an activity. I would say this is a bigger barrier to entry than any white MAMIL! I too have done the Ride London 100, and never got any strange looks from anyone. In fact for a while I joined a chain of guys until my legs turned to lead after Leith Hill! People have been saying "if you can't see it, you can't be it," meaning that you can't become something if you don't see people who look like you doing it. I can't say I identify with that phrase though. Fair enough, if I had seen other black women cycling I would have found it inspiring. However, there were no such sights when I was a child. Nevertheless, I still got inspired by the occasional young man I saw on a road bike around South Yorkshire, or the men I saw on TV riding the Tour de France. These Italians, Spanish or Irish guys who looked nothing like me still made me dream of riding up a mountain pass in Europe - and I eventually did it for the first time on a Graham Baxter training camp to Spain in 2000. I was the only black person in the part of around 60 participants, but it didn't bother me one jot. At no point did I ever feel that I should join a group of other black female cyclists, or black cyclists. I have only ever been interested in joining groups of pleasant people I can get on with, who have similar interests to mine. I find it hard to see how being black and female would be the basis for forming a group. There are various statistics around cycling. According to Cycling UK, in 2017 4% of the population rode their bike more than once a week, and 5% rode between two and five times a week. White people were three times more likely than people of South Asian and Chinese origin to cycle more than three times a week, rising to four times more likely than people of black origin. Another Cycling UK survey reported 8% of women in the UK describe themselves as regular cyclists (compared with 20% of men). So the figures for black women who cycle, would be low. There are various explanations such as issues around confidence and negative experiences on the road - things which aren't race-specific. 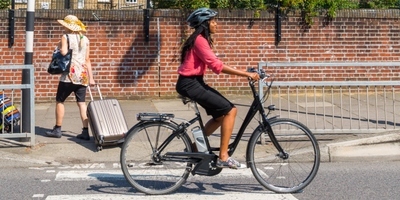 A survey by Transport for London did call out family responsibilities such as caring for children and other family members as a barrier to cycling for ethnic minority women. I am not querying these statistics, but for me the bottom line is and will always be about not allowing reports and statistics to bog me down, and just getting out there and doing the thing I want to do. As for the other points around representation, brand ambassadors or finding cycling groups where one can feel comfortable, there are various responses to that. On representation: Many years ago, when I first got into racing, British Cycling published a full-page photograph of me in action in their events calendar. I was wearing full club kit, with my race face on. It was quite a shock to see my mug plastered next to "March", but one can't say I was invisible! Some years after that I was photographed along with a few others as part of a marketing campaign for the Sky Rides. 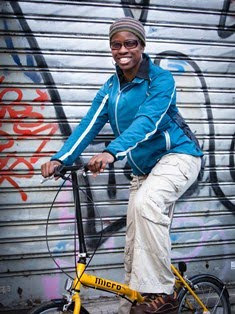 I regularly see photos of black women in Transport for London's marketing materials on cycling. So I find it hard to say there is no representation. In fact, considering that black people make up 5% of the UK population, and black women represent an even lower number than that, it wouldn't be realistic to see loads of women of colour in a campaign - particularly as so few ride a bike anyway. If black women would want to see more women represented in cycling campaigns, more black women need to get out on their bikes. And the facilities are available for that to happen. There are Breeze Rides, Cycling UK rides, Regional women's cycling groups and on-line forums, and a Velovixen forum specifically for women cyclists. There is no reason for any woman to feel isolated in cycling - regardless of race. I, myself set up a women's local cycle racing group with some other women in 2010. We appealed to women of all levels to join, and we organised rides for beginners too. We marketed this on-line and through the cycling media, but no black women turned up. Now I was racing at the time, and was regularly photographed racing. So what of "If you can't see it, you can't be it" for those black women who may have wanted to try biking? As for ambassador programmes - that is extremely competitive for anyone who applies. With hundreds of applicants, the odds of being selected are always going to be stacked against you, particularly as marketing managers want to see specific evidence that an individual's cycling activity fits with the essence of their brand. There are plenty of white people whose applications are rejected! Getting into cycling and doing it regularly is not especially easy for anyone, regardless of gender, race or the level people would like to achieve. You may well have to go out of your comfort zone at times, as well as reading and researching around the subject. That is just part and parcel of trying any new physically demanding activity. I am not saying that prejudices and issues don't exist in society, but I am inclined first to remember that we have a responsibility to put in the effort if we want to achieve an outcome, and we shouldn't be so quick to attribute difficulties in progressing, to society. So from a personal standpoint, a specific cycling group for black women isn't really necessary. Such groups that set me apart because of my colour give me a feeling that there's a special need and we're not like other folks. I am happy to go along to the meet-ups and socialise, talk about the latest cycling news, exchange tips and ideas. I am not interested in joining a moan-fest of people talking about being downtrodden and excluded though. At the meet-up there was talk of organising rides, and I would be happy to do some - though my rides will be defined by the terrain and level/speed, and not by people of a particular race or colour. They will be open to any woman (or man even) who wants to come along.